If you’re looking for a unique venue this year, then you won’t have to travel far to get something special. The catering and events contract at Kew’s Wakehurst in Ardingly was taken over by Graysons at the beginning of the year. Graysons look after over 40 sites around the UK, including Christchurch Spitalfields and The British Library. Head of Sales & Marketing Rebecca Hawkes explains: “Since taking over at Wakehurst, we have been delighted to introduce a number of new initiatives to rejuvenate the catering offering.” Using the ethos of ‘from farm to fork’ Graysons works closely with Slow Foods; a company dedicated to protecting products which are in danger of extinction with a particular focus on products from the Sussex area. “Developing a strategy like this nicely mirrors the amazing work of the team at the Millennium Seed Bank on site,” Rebecca goes on. 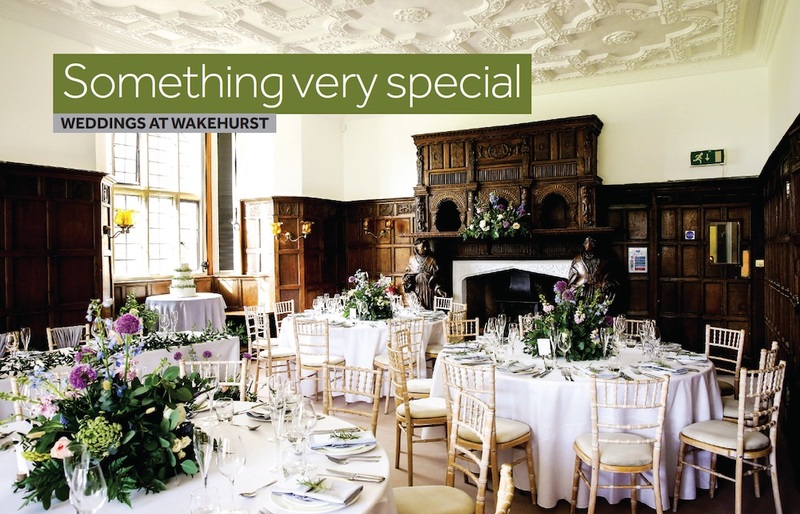 Wakehurst has three unique spaces available for a range of events, including social dining such as birthday parties and anniversaries, corporate functions and, of course, weddings. Firstly, there is the Mansion. This classic Elizabethan Grade I listed building dates from the 16th century and is highly recognisable locally. The rooms inside feature beautiful sculpted ceilings, ornate fireplaces and wood panelled walls – making you feel positively aristocratic for your big day! The Mansion can seat up to 80 guests, or host standing receptions for up to 180. You can also benefit from having your wedding day all under one roof, as the Mansion is licenced for civil ceremonies and civil partnerships also. Maybe you would prefer to be outside on the Croquet Lawn? This beautifully manicured garden can take a marquee housing up to 200 seated guests for your event. Overlooking the Mansion and lily pond, it provides a natural photo opportunity, whilst guests can mingle and spill out into the delightful walled garden. By contrast to the previous two, Wakehurst also boasts a cutting-edge contemporary space in the form of the Millennium Seed Bank, which can comfortably hold up to 200 guests for a standing drinks reception and is perfect as the venue for a corporate event. Whichever space you choose to host your event, you will be able to take advantage of over 500 acres of wild botanic garden, with stunning photo opportunities ranging from the picturesque English Walled Garden, temperate woodlands of the world or magical reflections on the lakes. When hosting an event at Wakehurst you will also benefit from free use of the designated events car park. Making a booking at Wakehurst will also give you access to Jo, who will act as your bespoke coordinator for your event. “All events, especially weddings, are as unique as the people that book them,” she explains. “I love my job, and the part where I meet the wedding couple and talk through the vision for their big day is very exciting.” After the initial enquiry and being shown round the venue, Jo gets to work planning a bespoke package which brings in the couple’s own personalities – including tasting sessions with the Chef. If you’d like to find out more about the facilities at Wakehurst then head over to their website www.kew.org/venue-hire where you can see images of the spaces and information regarding packages. Alternatively, call Jo on 01444 894024 or email wakehursthire@graysonsvenues.com and she can discuss your plans and arrange a viewing so you can see the stunning spaces for yourself!